Here’s a shoutout to Professor Russ Rowlett, whose years of work have given everybody access to what could be the world’s largest database of lighthouses. “For many years, Russ Rowlett, a mathematics professor at the University of North Carolina, has been building one of the most useful lighthouse related sites on the Internet,” the Lighthouse Society reports. “The Lighthouse Directory provides information and links for more than 20,700 of the world’s lighthouses, divided into sections by countries and regions. There’s also a list of the latest lighthouse news headlines and other pertinent facts. Anyone who’s struggled to find information on a lighthouse, famous or obscure, has probably gone to the Lighthouse Directory in search of enlightenment at one time or another,” the Lighthouse Society says. Spend a year of rainy weekends on Russ’ Lighthouse Directory and you still probably won’t finish it all. It’s constantly being updated, too. That’s http://www.ibiblio.org/lighthouse/. November 27, 1903: How Graves light looked after its first 7 months of construction. One hundred and fifteen years ago today, Colonel Stanton of the Army Corps of Engineers took advantage of calm seas to photograph The Graves, documenting work accomplished in the 1903 season. Remarkably, in seven months, the workmen prepared the ledge, constructed temporary cofferdams and wharves, built a barracks and footbridge, and set half the tower’s stones into place. The next year would see the rest of the tower, interior tiled walls and stairs completed. Graves Light went operational in September, 1905. 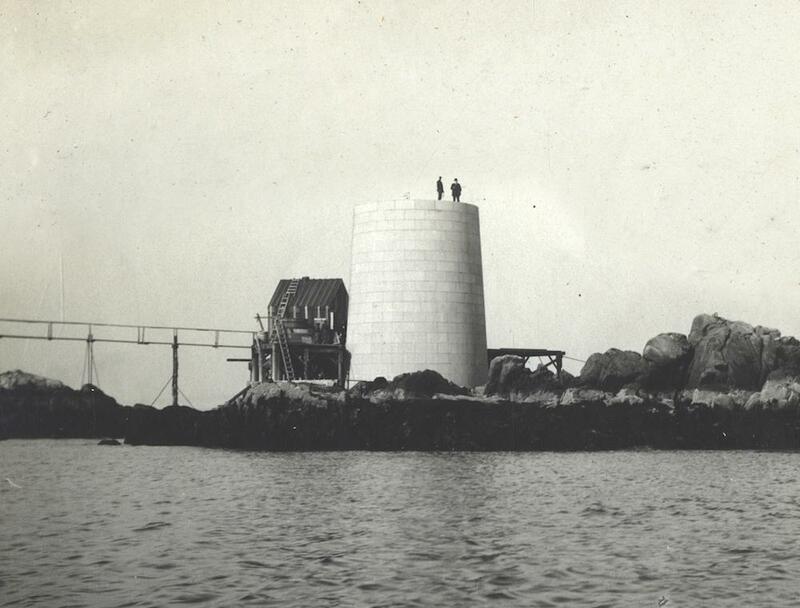 Click here for more historic photos of Graves Light’s construction, along with copies of many of the original blueprints and diagrams. 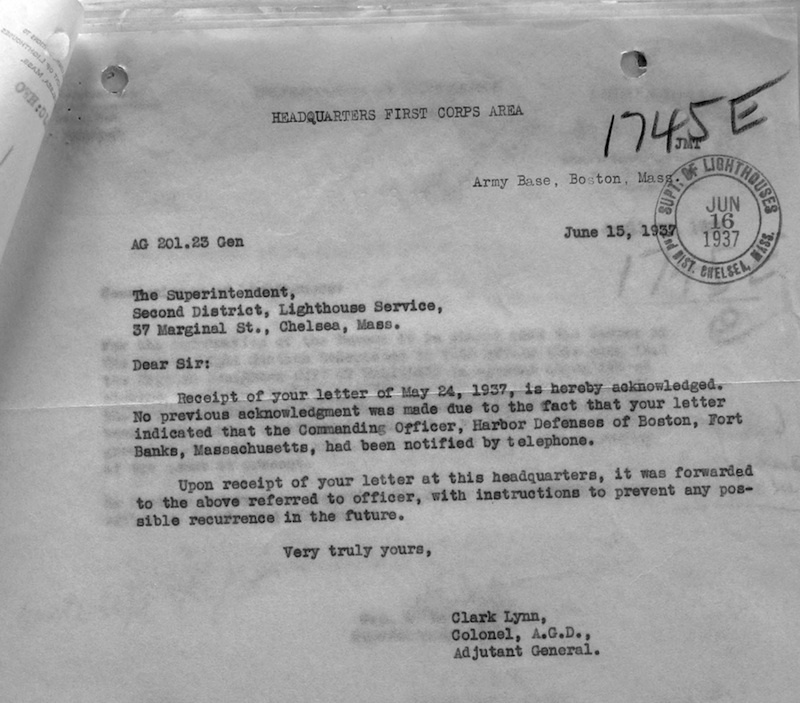 Artillery practice before World War II caused one shell to land too close to Graves Light, prompting the Superintendent of Lighthouses to issue a sternly worded letter to the Commanding Officer in Boston. The 1937 incident was the only time the granite tower was ever shaken. It happened on May 21 of that year, when the Army’s coastal defense force at Fort Banks in Winthrop practiced shelling Boston Harbor’s narrow outlet to the sea, apparently to ensure that they could strike at any enemy ships trying to enter the port. The thunderous artillery practice had shattered the keepers’ dinner plates at Graves Light. Fort Banks was home at the time to two batteries of huge Endicott 1890M1 mortars to defend Boston Harbor against enemy warships. A total of 16 mortars provided a formidable defense for the harbor. Each mortar was 12-inch caliber, meaning that each fired an explosive shell 12 inches in diameter. Each shell contained between 700 and 1,046 pounds of explosives. Each mortar could hurl the shell between 7 and 9 miles. 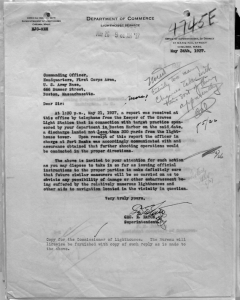 A researcher at the National Archives in Washington has discovered carbon copies of the letters exchanged between the US Light House Service and the Department of War from May and June, 1937, settling a matter between the artillerymen and the Graves Light keepers. 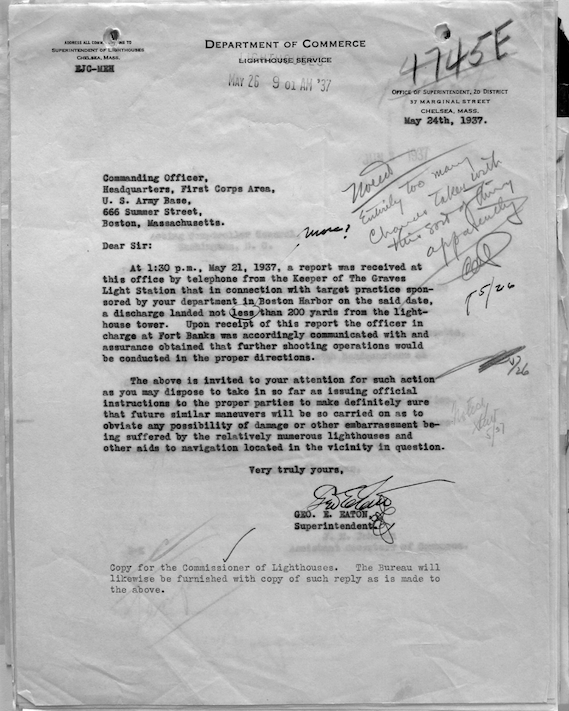 The correspondence shows that at about 1:30 on the afternoon of May 21, 1937, the keeper at The Graves phoned his superintendent in Chelsea that during artillery practice from Fort Banks, one shell landed within 200 yards of the lighthouse. That resulted in a phone call to the commanding officer at Fort Banks, who made sure it wouldn’t happen again. 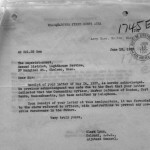 It seems that no further incidents occurred, though the recorded correspondence, typed on manual typewriters and sent via the Postal Service, took some delays that in retrospect seem curious. Eaton described the matter, making a correction about the distance of the target zone from the lighthouse. A modern Federal Emergency Management Agency (FEMA) chart (fig. 4.2, p. 8) shows that the lighthouse crew was right to be upset: A surface explosion of 700 to 1,000 pounds of TNT would produce severe wounds from flying glass in a building 200 yards away. The letters appear on this page. Click on each image to enlarge. The smokestack of the SS City of Salisbury snaps off as the hull of the wrecked steamer makes its final plunge. The bottom photo was taken minutes earlier. The photographer was aboard a US Coast Guard vessel. 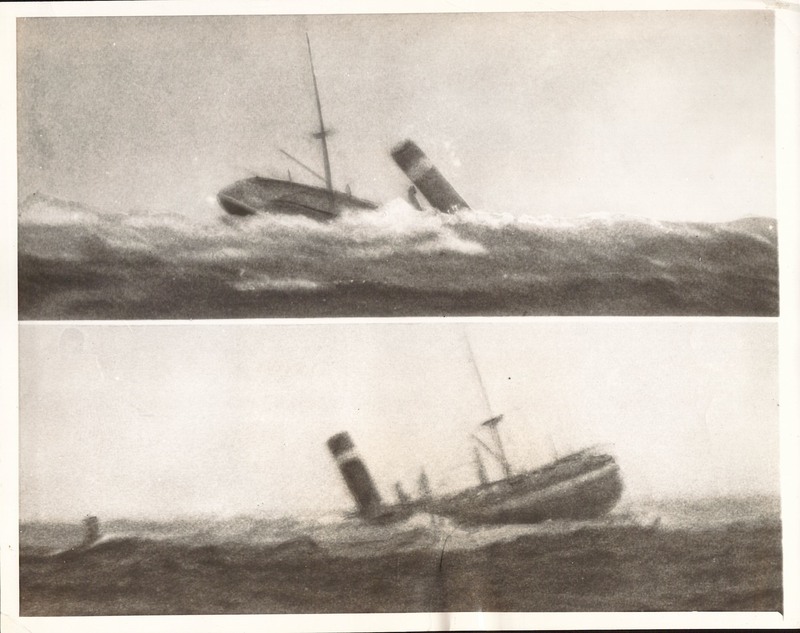 Our unstoppable archivists have recovered dramatic photos of the salvage and sinking of the SS City of Salisbury. 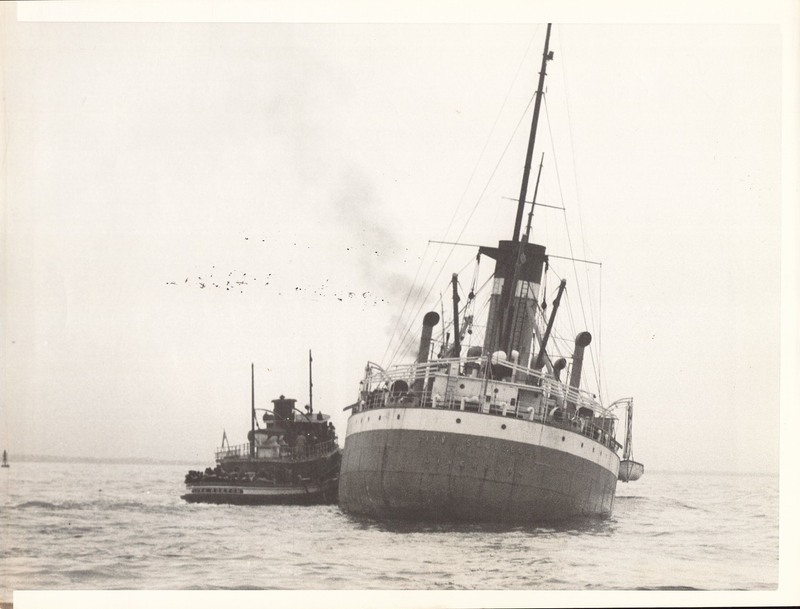 The famous “Zoo Ship” sank 76 years ago today. 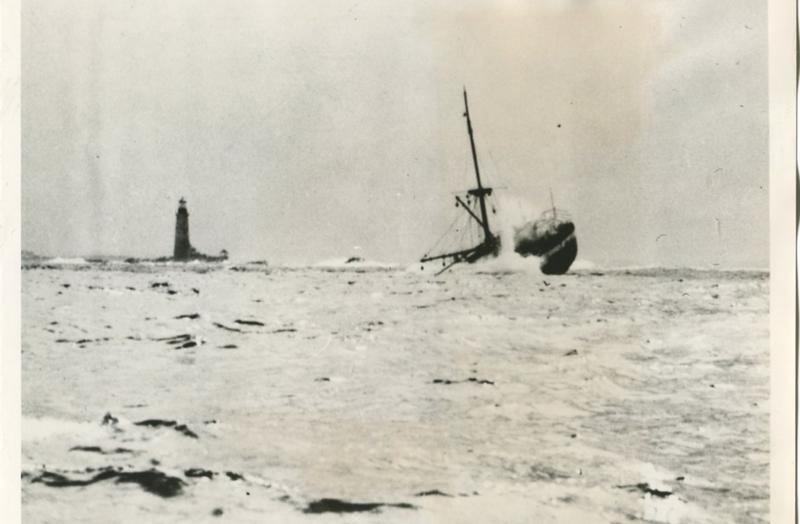 Graves Light Station has acquired the historic Associated Press photos of the 1938 shipwreck. The vessel wrecked off Graves Ledge in April, its keel broken on an uncharted ledge. The big steamer sank the following month. 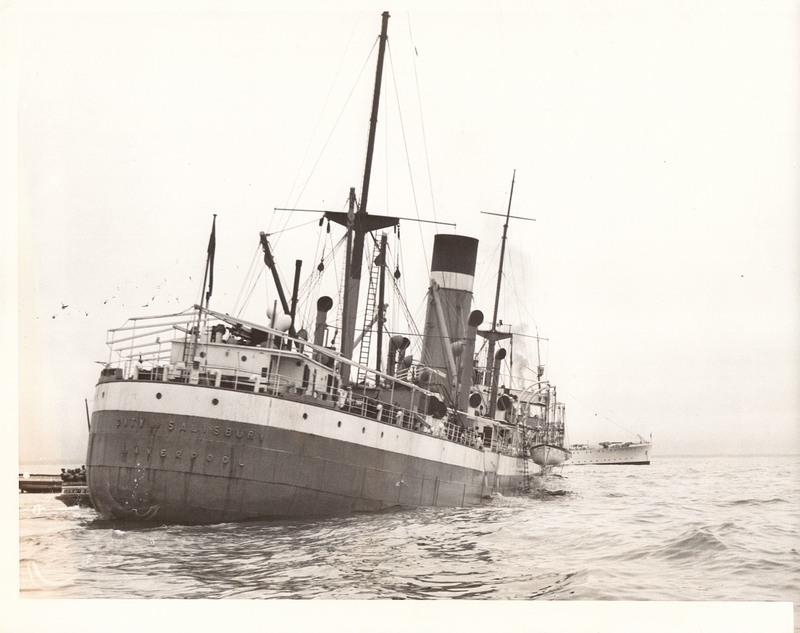 Most of the vessel’s cargo of exotic animals from India and Ceylon survived, and all the people on board escaped unharmed. We have been scouring antique photo collections and old newspaper archives for images of wrecks, rescues and other events around Graves Light, and already had a number of original pictures from the SS City of Salisbury. 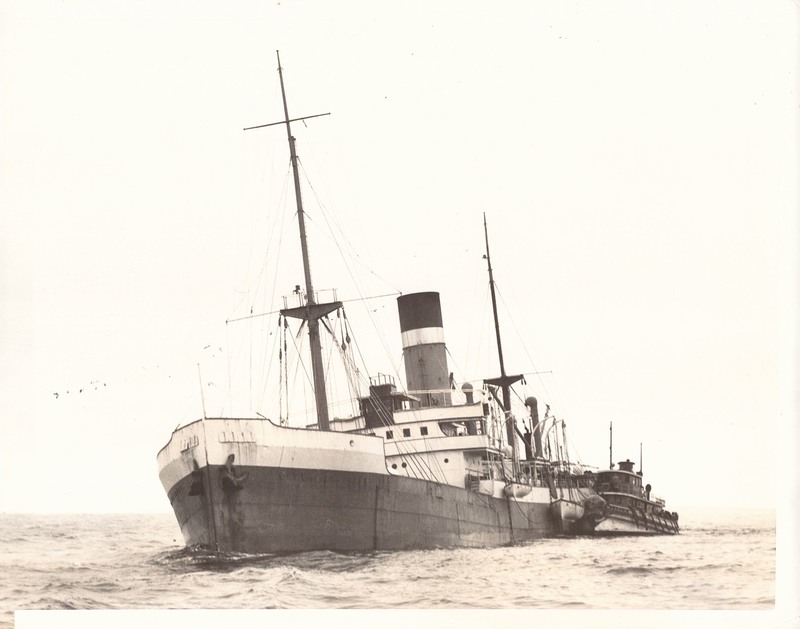 The earlier pictures appear on the shipwreck page on this site, and on our posting from last November. The latest collection of eight original prints are from the Associated Press, acquired from a dealer in Tennessee. 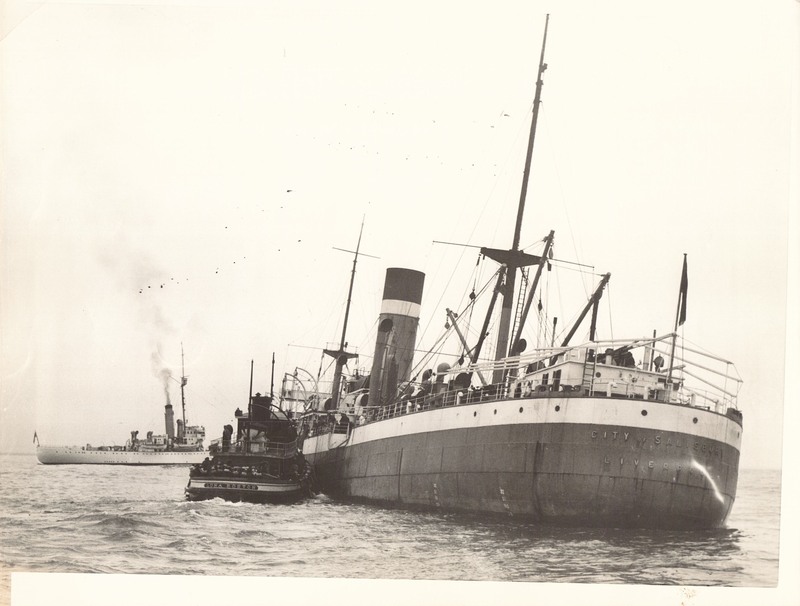 The smokestack of the SS City of Salisbury snaps off as the hull of the wrecked steamer makes its final plunge. This August marks the centennial of the first swimmers to Graves Light. We just discovered this today, when Carol went to the Library of Congress in Washington, DC, to do some research. 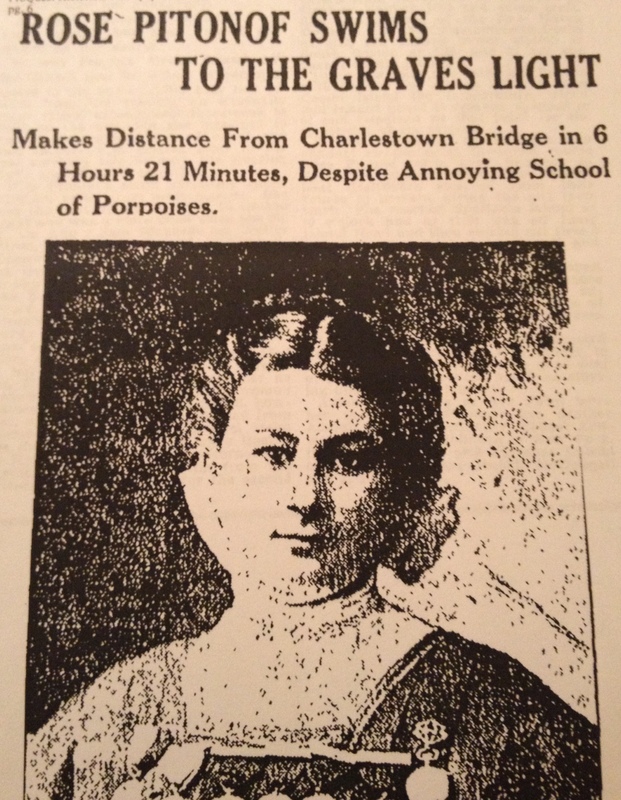 She came back with articles from the Boston Daily Globe from August, 1914. August 2 is the 100 year anniversary of the first men to swim to Graves Light. August 17 is the 100 year anniversary of the first woman to make the swim. All of them swam 12 miles from Charlestown Bridge to The Graves. The historic swimmers were Samuel Richards Jr., of the L Street Swimmers’ Club (better known as the L Street Brownies), who made the swim in 5 hours and 54 minutes; Henry Miron of Abington; George E. Hardy of Marlboro; and William R. Kessener, also of the L Street Swimmers’ Club. 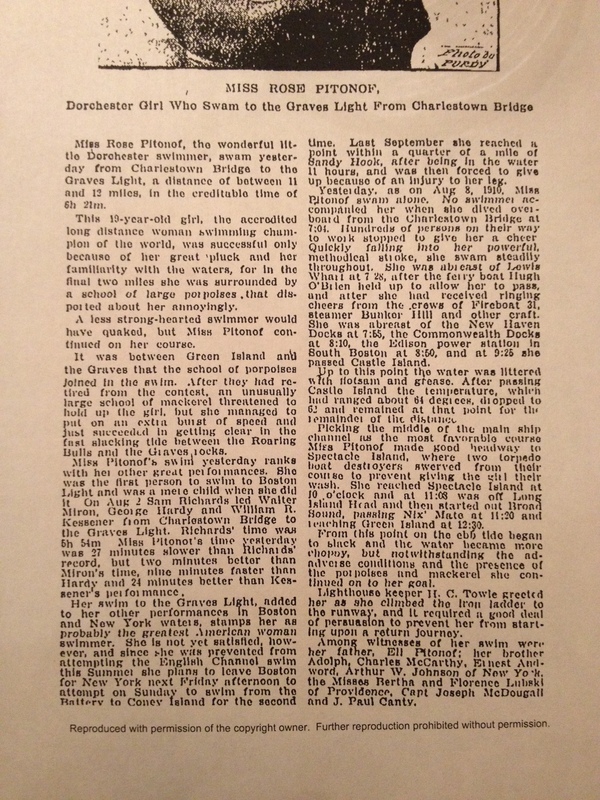 Just two weeks later, 19 year-old Rose Pitonof, whom the Globe called “the wonderful little Dorchester swimmer,” swam the same route in 6 hours and 21 minutes. Had she swum with the men, she would have placed second. 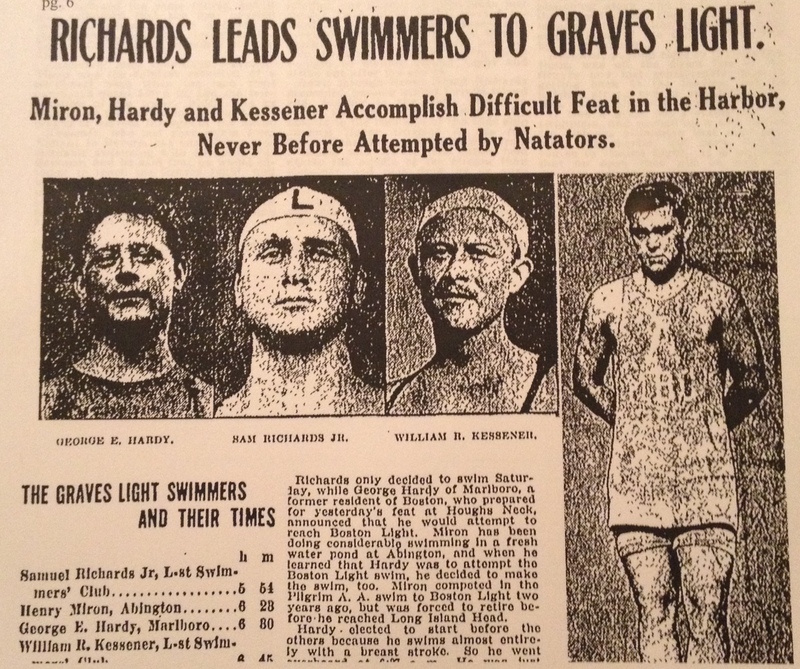 Richards was a well-known distance swimmer, but his three colleagues were unknowns. Rose Pitonof was famous as a world-class distance swimmer, and had previously attempted to swim across the English Channel. The swim to Graves Light was “a feat never before accomplished or attempted,” according to the Globe. Richards had decided to make the swim just the Saturday before. Hardy had planned to swim only to Boston Light. Miron, age 18, swam at a “fresh water pond at Abington,” and decided to swim to Boston Light when he heard of Hardy’s plans. He had tried but failed to swim to Boston Light two years earlier, in 1912. Kessener apparently planned the swim as a member of the L Street club with Richards. Hardy started the swim before the others, “because he swims almost entirely with a breast stroke,” the Globe reported in a lively, blow-by-blow report. During his swim, Richards was thinking about a planned date that evening with his wife and a group of friends, aboard the Harriet, “to take dinner at Boston Light, six miles away.” He reportedly considered the Graves swim as preparation for a planned swim across the English Channel. “It was a great day’s outing for the swimmers, and opened up a new course for distance swimmers that may supplant the shorter, but more difficult course to Boston Light,” according to the Globe. After arriving at Graves Light, Miron and Hardy were immediately welcomed as the newest members of the L Street Swimmers’ Club. “A less strong-hearted swimmer would have quaked,” according to the Globe. Rose Pitonof tried several times to swim the English Channel, and became a Vaudeville performer. She married a local dentist and raised a lively family, and passed away at age 89 in 1984. 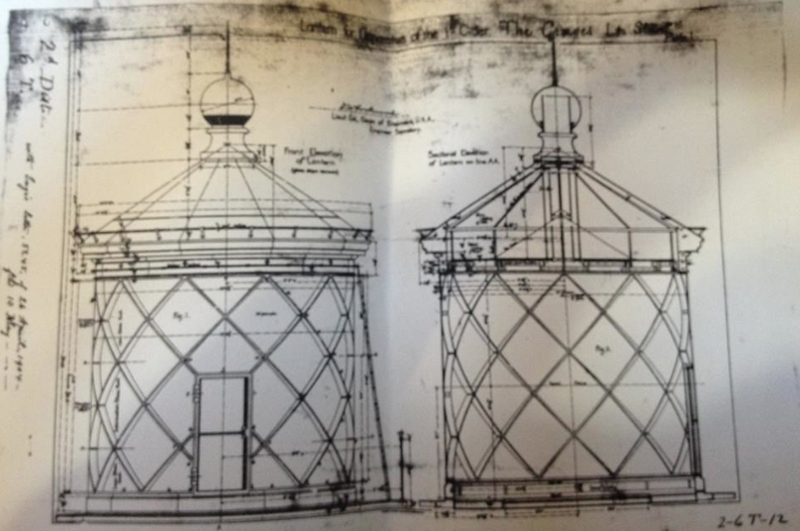 Just discovered: Copies of the original architectural drawings of Graves Light from 1903. We’re just going through them now. 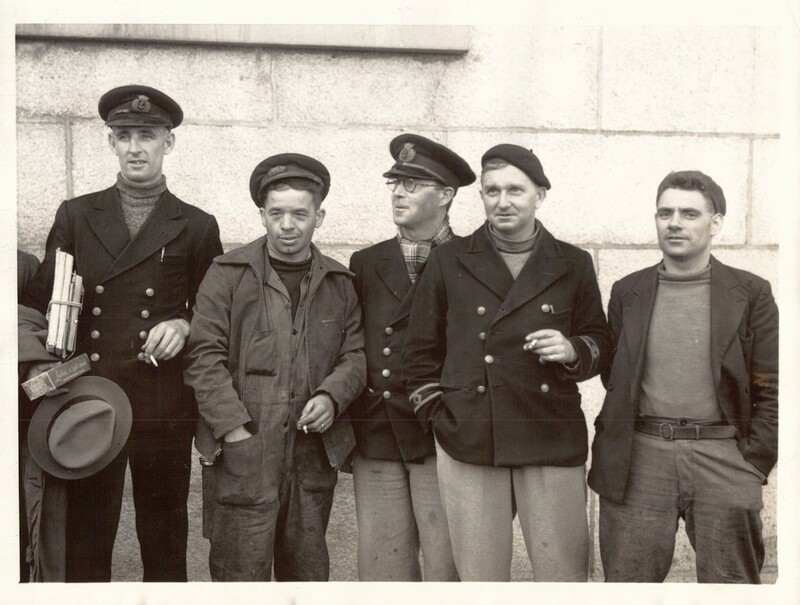 The US Coast Guard Historian recommended a professional archivist to us, who knows the Coast Guard and US Light House Service records at the National Archives in Washington better than anyone else. The drawing pictured is of the lamp room and roof. It gives a good idea of what we’ve found so far. Other drawings literally get down to the nuts and bolts. 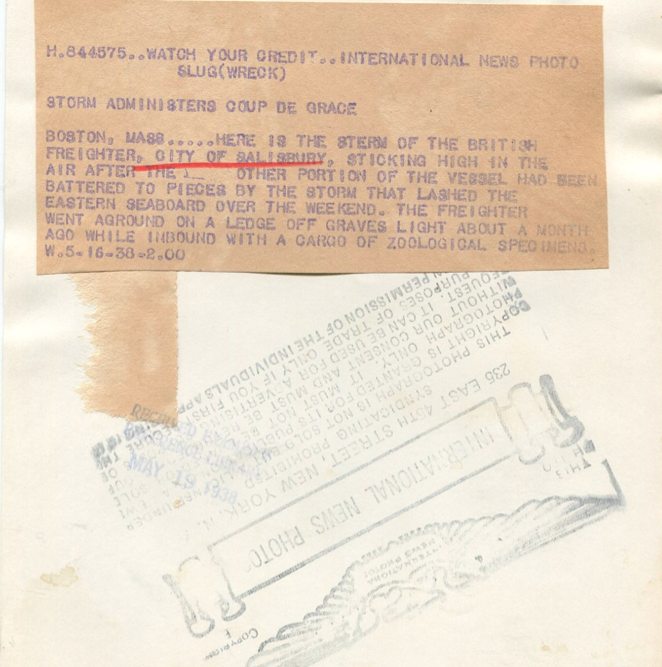 Almost none of the Graves Light records at the National Archives are imaged electronically. We have hired the professional archivist to digitize everything she can find, and will provide the electronic images to the Coast Guard Historian’s office and to the National Archives. ‘Storm administers coup de grace’ is the news caption on this original 1938 photo from the archives of the San Francisco Examiner. We acquired the original from the Examiner archives. 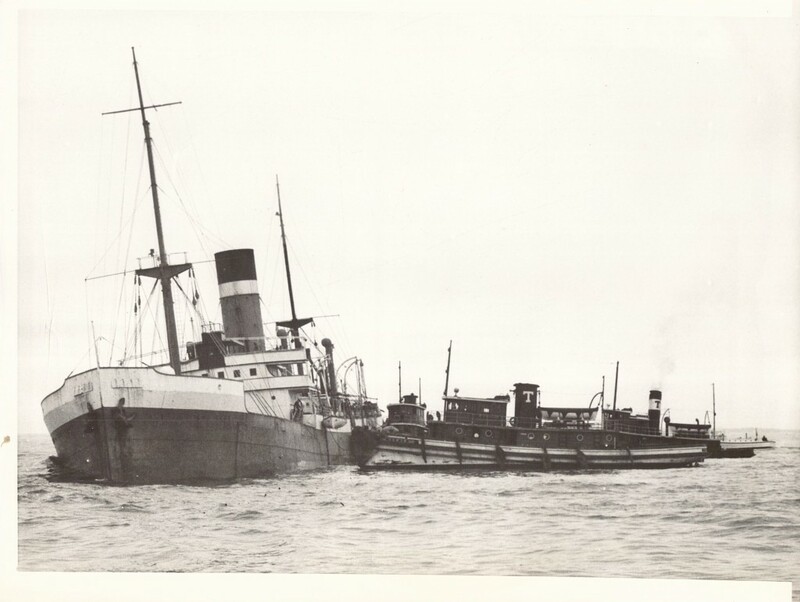 The reverse of the 1938 news photo of the ‘coup de grace’ sinking of the SS City of Salisbury. This International News Photo is an original print from the archives of the San Francisco Examiner. 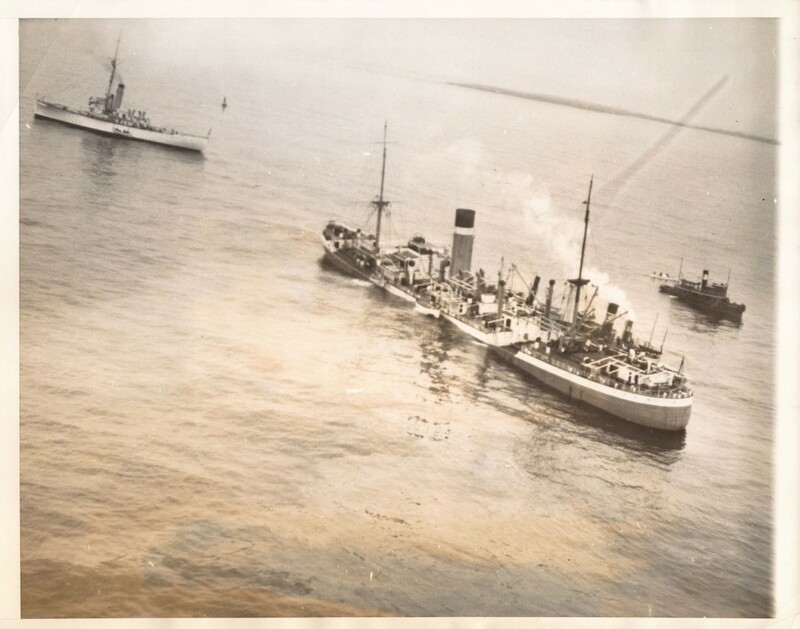 While rooting through old news archives, we found an original wire service photo of the sinking of the SS City of Salisbury, with Graves Light in the background. We don’t mind posting pictures of this wreck, because nobody was hurt. So we’re particularly excited with our new find, which we acquired from the archives of the San Francisco Examiner. Posted here is the original photo, and an image of the reverse, with the commentary from the International News wire service.